When it comes to looking young, it's important to concentrate your efforts on the areas that matter most. That means focusing on areas that show your age first or areas that are easiest to affect. Sometimes, however, it can be overwhelming to know where to start. Fortunately, researchers recently released a couple of new studies that offer some guidance. They published the first in the June issue of the International Journal of Cosmetic Science. In this study, they tried to determine which skin characteristics contribute to our perceptions of age. They asked 629 female Russian participants, ages 20 to 65 years old, to estimate the ages of Russian women aged 40 and above in 203 photographs. Then they compared the data to previously determined differences in 23 facial skin features. They found that nine such features contributed the most heavily to the participants' perceptions of the women's ages. In particular, they focused on wrinkles, particularly around the eyes and on the forehead; sagging, especially at the jawline; and hyperpigmentation. Clearly, targeting these three areas can make a big difference. Another study, conducted at Japan's Kagoshima University Graduate School of Medical and Dental Sciences, has provided new information on why eye wrinkles in particular need treatment. Our skin contains sebaceous glands, which secrete oil to lubricate the skin and help protect it. However, our sebaceous glands are not evenly distributed across our faces. This study found that wrinkles tend to be deeper in areas with fewer sebaceous glands, particularly the areas around the eyes. Through examining 58 Japanese cadavers, from people in their 20s to 90s, the researchers determined that the more sebaceous glands present in the forehead, the shallower the wrinkles in that area. The area just outside the corner of the eye doesn't have these glands, so this may be why wrinkles deepen faster there. The researchers do caution that because their research was only on Japanese cadavers, the results may not apply to others. However, their work does raise an important reminder: the skin around the eye is delicate, and it needs special attention. Left untreated, it often wrinkles faster and more deeply than the rest of our skin. As the first study indicated, this can cause us to look older. 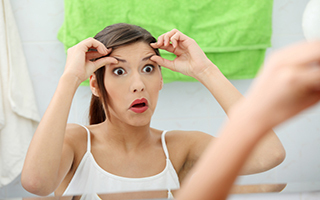 Fortunately, there's a lot we can do to keep the skin around our eyes looking young. First, drink plenty of water. Hydration is essential to flushing toxins out of the skin and keeping skin elastic and healthy. Second, get plenty of sleep. I don't have to tell you that the skin around your eyes doesn't look healthy when you aren't well rested. Third, protect your skin from the sun, both with sunscreen and with sunglasses. Finally, a good eye cream is a key component of keeping your skin looking young longer than it would naturally. Try the Système 41 Eye Serum. With over 30 nutrient-dense, natural, non-toxic ingredients carefully selected to protect and enhance this delicate area, it helps rehydrate, reduce puffiness, and minimize the appearance of lines and wrinkles. 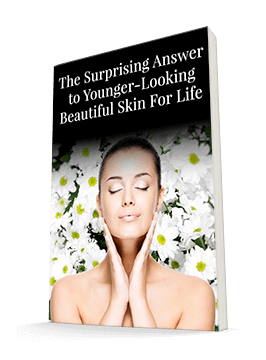 It's one of the best tools to avoid the appearance of aging that I know of.